Shy, secretive, and challenging are among the adjectives often used describe one of North America’s most obscure game birds. Rail birds are small wading birds that inhabit marshlands along the Atlantic Coast, Mississippi and Central flyways. With the exception of the Atlantic Coast, rails are not widely pursued by hunters. Not because they do not offer some challenging hunting opportunities, but rather due to the secretive nature of the birds. Many hunters do not even know about them or where to look for them. Hunters who do pursue rails know they provide some good early-season action. One of the attractions of rail hunting is the challenge of actually locating the birds. Rails stay close to wetland cover and are rarely seen by anyone. Hunters should look for rails near the edges of wetlands in shallow water or mud flats, where they most commonly are found searching for food. It is not unusual to find rails in the same habitat as snipe or woodcock. One of the best techniques for locating rails is to walk along the edge of a wetland in an attempt to flush them out like a pheasant. A dog can be helpful in locating the bird, especially in heavy cover, and the early-season action can provide a valuable training opportunity for many hunting breeds. Along the Atlantic Coast, hunters use flat-bottom boats to access the marshy areas where rails are found. When rails sense danger, they may run or dive, rather than fly, but if they are driven into a confined area, they are more likely to use flight as their method of escape. The rail’s flight pattern also provides a challenge for hunters. The bird often flies erratically and can be tough to hit, but it also flies slowly and low to the water, which is a benefit to hunters. The same shotgun and load used for ducks is adequate for rail hunting. A .410 or 20-gauge with No. 6-9 shot is an ideal combination. The best rail hunting occurs in early to mid-season. In the northern reaches of the bird’s range, the migratory population of rails moves southward in late September. That date stretches into late October in more southern locations. In addition to the challenge, one of the true benefits of rail hunting is the meat, which is among the best tasting of any small-game birds. 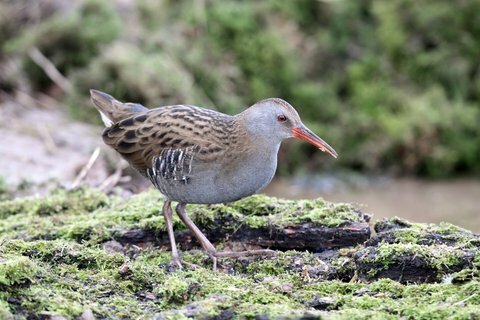 There are four species of rails in the U.S.: the clapper, king, sora and Virginia rails. Not all of the species are found in the same regions and some states have limitations on which species are open to hunting.